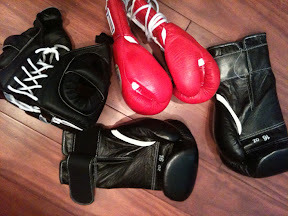 This morning I hit mitts with Trevor. Now I'm resting up for wrestling practice later tonight. I have all my training planned out for my fight. Thursday, I will be heading out to Albuquerque to train. Then I come back Saturday for the SAF charity event. Here is the gear I just got in. My old stuff is worn out!